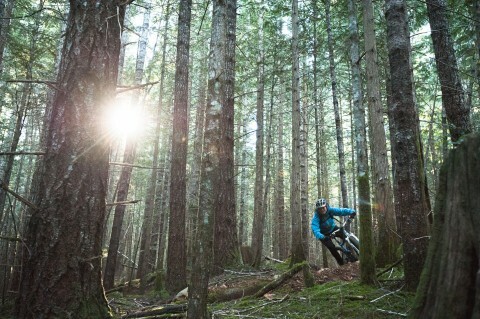 Cumberland, BC – The United Riders of Cumberland (UROC), Village of Cumberland, TimberWest Forest Corp., and Hancock Forest Management are excited to announce that a land access agreement has been reached to formally allow non-motorized recreation on private managed forest lands adjacent to the Village of Cumberland. This progressive and multi-faceted agreement not only authorizes public recreation on private and public forest lands south of the Village, but gives the private landowners the opportunity to better communicate and manage risks associated with people recreating on their land. For the Village of Cumberland, the agreement helps to move forward Council’s goal of improving recreation opportunities in the community. Under the terms of the agreement, UROC will take on key trail management and maintenance responsibilities for the approximately 70km Cumberland trail network, while also continuing to work in partnership with local trail builders and other stakeholders. UROC will be working closely with the Village of Cumberland and private landowners on several trail infrastructure projects, including new trailhead information kiosks and the replacement of bridges over important stream crossings. Next up, UROC will be completing an inventory of the trail network to determine trail maintenance priorities and confirming trail difficulty ratings. Over time visitors to the area can expect to see upgraded trail signage, improved route information, and consistent and proactive trail maintenance. • The United Riders of Cumberland is a Cumberland-based registered society that organizes events, group rides and other activities for mountain bikers of all ages and advocates for trails on behalf of all users. UROC requests that all trail users consider becoming members of the organization to assist the club in its new role in trail management. Check out www.unitedridersofcumberland.com for more info, or search them on Facebook for updates and trail notices. • TimberWest is Western Canada’s largest private timberland company with 325,400 hectares / 804,200 acres on Vancouver Island and leads the coastal industry in the growing and harvesting of second-growth timber. The Company is a leader in sustainable forest management and is committed to Vancouver Island communities. • Hancock Forest Management manages timberlands for large private investors. Hancock Forest Management is a wholly owned subsidiary of Hancock Natural Resource Group (HNRG), providing property management services for HNRG investor-owned properties. The Company manages nearly 6.8 million acres of timberland globally. In the Northwest Division, Hancock manages land in Washington, Oregon, California and British Columbia. • The Village of Cumberland will continue to maintain trail management responsibilities for trails in the Cumberland Community Forest, Coal Creek Historic Park and other Village parks and trails with the support of UROC and other stakeholders. UROC will take on primary trail management responsibilities on the 193 ha of Village-owned lands in the Perseverance and Cumberland Creek watersheds.